When toxic chemicals spilled into the Elk River in Charleston, West Virginia a couple of weeks ago we got another glimpse into what the world might look like in the aftermath of a major, widespread disaster. There were several lessons we can take from this regional emergency and all of them are pretty much exactly what you might expect would happen when the water supplies for 300,000 people become suddenly unavailable. Studies have suggested that the average person has about three days’ worth of food in their pantry, after which they would be left with no choice but to scrounge for scraps once their food stores run out. We saw this scenario play out after Hurricane Sandy, when thousands of unprepared people lined up at National Guard operated FEMA tents and temporary camps. That’s what happens when there’s no food. With water, however, it’s a whole different matter. Food we can do without for weeks, but lack of water will kill us in a very short time. The events following the Charleston chemical spill highlight just how critical fresh water is to maintaining stability. Immediately after the announcement, the stores in the area were rushed for any bottled water products. 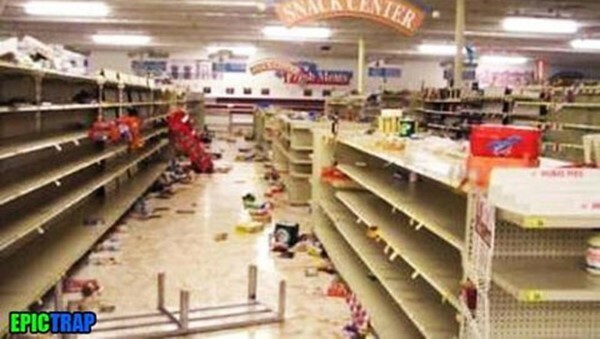 Within an hour the stores were emptied. Do not let anyone tell you that everything was nice, peaceful and everyone conducted themselves gracefully. There were fist fights and scuffles for the last of the water. After the order was issued no one could give any answers as to when drinkable water would be available. Those with water were either hording it or selling it at enormous prices. 48 hours after the ban, water began to be distributed to the everyday person. Hospitals and nursing homes received the first shipments. By the way the hospitals (except one) were not taking any new patients). If you got hurt or injured you were on your own or had to travel an hour away for treatment. What if the spill was more serious or the supply of water non-existent? Would you have enough water on hand and the means to disinfect new sources to take care of your family? It is news like this that illustrates for anyone paying attention the importance of storing water. If you live an area affected by a water supply contamination and have no water reserves, this report suggests that you have less than an hour to stock up. And during that hour there will be panic with the potential for violence being highly probable. This is a no-brainer, but nonetheless worthy of mention. 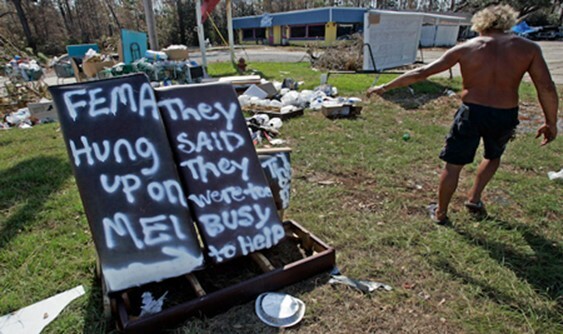 We saw it after Hurricanes Sandy and Katrina – thousands of troops and militarized police deployed to prevent looting and rioting. The fact is that when the water and food run out people will be left with no choice but to rob and pillage. It becomes a matter of survival. Crowds will unwaveringly stampede to get to the resources they need. They’ll stomp over you if you happen to fall on the ground in a rush, because when the herd starts running nothing will stop it. There is a reason the government has been preparing military contingency plans and simulations for events that include economic collapse or a massive natural disaster. They know what will happen if millions of people are left without critical supplies. In Charleston, after water supplies started being delivered to grocery store chains, local government and the companies themselves brought on hired guards to keep the peace. The Elk River event was limited in scope, affecting about 300,000 people in an isolated area, thus it was not that difficult of a situation to contain as FEMA and government could throw all of their resources and assets at the problem. But imagine a scenario that involves multiple large metropolitan areas simultaneously in different regions of the country. There are simply not enough personnel (or supplies) to respond to such a situation and maintain order. It took emergency responders five days to get water to the Super Dome in New Orleans following Hurricane Katrina. Following Sandy, FEMA had enough food and water to provide the absolute basic necessities to about 50,000 people. In Charleston it took at least two days to get water supplies moving. If this were a massive catastrophe it could be weeks before help arrives. The Federal Emergency Management Agency has itself warned that it is not equipped to handle large-scale emergencies. It’s for this reason that they strongly recommend a minimum two week supply of food and water. Considering that the majority of Americans have maybe three days worth of supplies, how many millions of mouths would need to be fed three square meals a day if we experienced a multi-city event? In 2011 a FEMA/DHS organized National Level exercise simulated an earthquake on the New Madrid Fault in the Mid West. The simulation revealed that 100,000 people would be killed almost immediately, and another 7 million would be displaced from their homes. They would only have one place to go – government managed FEMA camps. Those seven million people eating just two MRE’s per day would consume FEMA’s entire emergency food reserve within 10 days. Prepare now, because the last place you want to be in is in the midst of crisis-driven panic.